Using content to attract sales leads requires a deep dive into the human psyche. It wasn’t always this way, but as concepts such as the buyer’s journey and gated content become the norm, competition for attention has intensified. It’s not good enough anymore to dangle a white paper and expect prospects to volunteer to be contacted in exchange for a download. To find a worthwhile lead, we need to reach the right person at the right time with content that answers the buyer’s personal information needs. Figure 1 depicts this targeting, also showing that the right kind of content will align with the business imperatives faced by the sales prospect. When we can hit this target, we will have found a lead worth contacting. The risks from incorrectly targeted leads include wasted effort and misspent budget. Even if you’re paying $2 per click to reach people who are not in a buying mode and do not find your material to be an answer to their specific, immediate information needs, you will be wasting money. There’s another dimension to this potential problem, too, which is to have the right content but misunderstand how to attract the right kind of eyeballs. The content marketing challenge is two-fold. Not only do only do you have to have good content, you have to promote it effectively. To avoid these common content marketing traps, we need to get inside the lead’s head. It’s critical to understand this group-to-personal hand-off when devising a content marketing campaign. The lead is invariably an individual who works for an organization. The lead’s personal information needs line up with those of the organization but they are not the same. As content marketers, we can turn potential energy into an actual lead when match the buyer’s “I need to” with content that fits the buyer’s “I respond to” criteria. 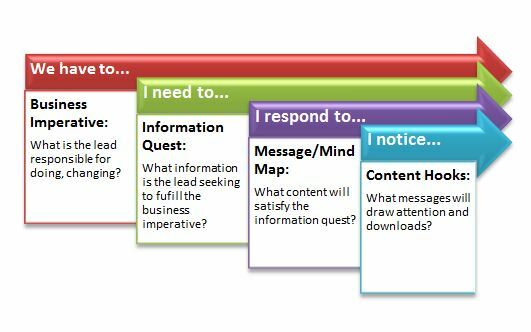 The content we develop has to speak to the lead’s information quest. For example, an infrastructure manager may not want to register for a white paper titled Making DevOps Work in the Cloud. It’s related to his or her information quest but it’s not actually addressing it. A paper about cloud DevOps is not well targeted to the IT manager buyer persona. Instead, that buyer might respond to a paper called Budget Cutting Best Practices in the Enterprise Cloud. Finally, with the right content, we have to attract the lead’s attention. We have to ask “What will the buyer respond to?” through the content development and campaign execution processes. 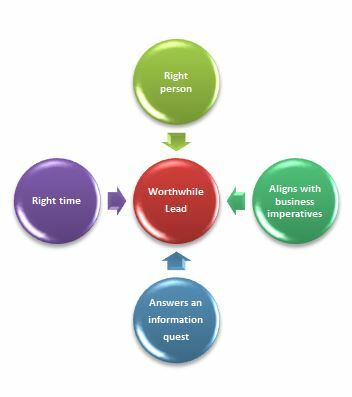 We have to align the lead’s “I respond to” with his or her “I notice” in order to generate a useful lead registration. This is a nuanced game. We want to get clicks and registrations from the right leads, but if we’re paying by the response, we don’t want to attract everyone. If we promote the budget cutting paper with an ad that says, “Save money in the cloud,” we will likely get a lot of useless registrations. Who doesn’t want to save money in the cloud? We have to stay focused on our mind map. Humanizing the buyer’s journey requires that we understand our target buyer personas well enough to develop a good working theory on how their minds work. It is an exercise in emotional intelligence. And, it doesn’t end with the launch of the campaign. As we review early results, we can improve the click-throughs and qualifications of the registrants if we refer back to the original “We have to, I need to” flow. 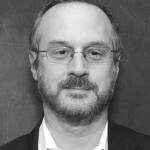 Hugh Taylor, is the President of Taylor Communications, a firm specializing in long form content for technology companies and the author of the book B2B Technology Marketing. You can follow Hugh on LinkedIn.